Remember this pic from a couple of weeks back? I was telling you about the things that I can't get by without in my studio?...... and also how much I love turning loops. At that stage, my Cha Cha bracelet was jut beginning to take shape. 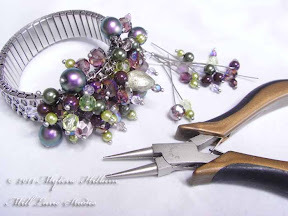 My bracelet base has three rows with a total of 144 individual loops. And because I like turning loops so much, each one of those 144 loops is a wrapped loop to make it really secure..... I mean, you don't want to go doing the cha cha and find the beads go flinging off onto the floor now, do you?! I got quite carried away putting this bracelet together and I couldn't stop at just one bead per loop. There are 3 and even 4 on some of them so it is a really plump bracelet and you can't see the base at all. 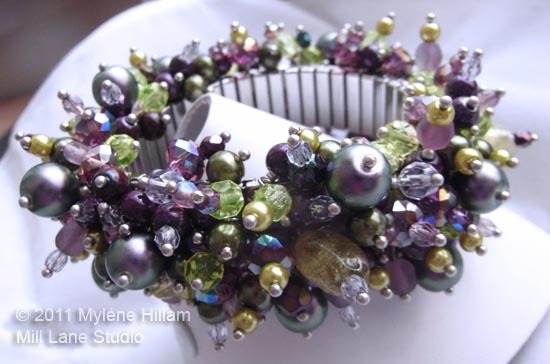 It still jingles the way a cha cha bracelet should but it's just really chock full of beads! I didn't count how many all up but I know there are more than 300. This is the perfect project to complete in front of TV - one you can pick up and put down without losing your place. With so many loops to make, it will take a bit of time and patience when the going gets fiddly, but I think the end result is worth it. Here it is after a few night's work. 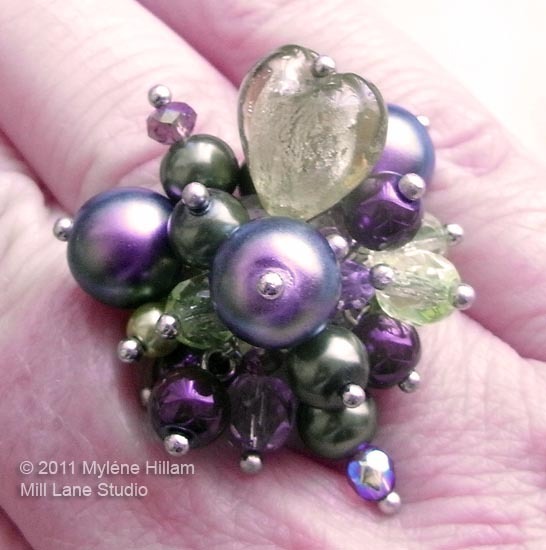 I had a few beads left over that I just couldn't fit on the bracelet so I also made a matching ring! The ring took less than an hour to complete so if you don't feel you have the staying power to make a full bracelet, a Cha Cha ring is a good place to start. Now I'm all set to cha cha cha.... pity I don't have a dancing bone in my body! I don't have the patients for all that wrapping. It's a beautiful piece. Love your work. Ah, but Pam, you make the most beautiful beads! Thanks for your kind words about my jewellery. Hi Danielle. They're really not difficult to put together.... just a bit fiddly. But I'm glad you've added one to your collection... they are a fun piece of jewellery to wear!